James Neiss/staff photographerNiagara Falls, NY - Members of the Niagara Falls Fire Department raise the Patriot Flag at Table Rock as part of a national tour that began on Sept. 10, 2010 and ends August 2011. 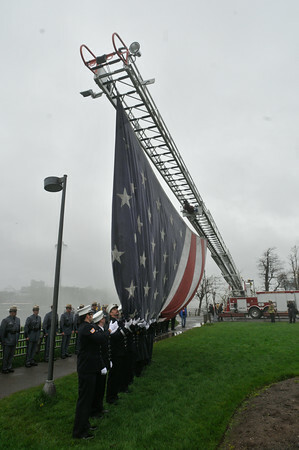 The Patriot Flag - 30 x 55 feet - is being flown from atop a Niagara Falls Fire Department ladder truck for approximately 55 minutes. Fifty-five minutes was the elapsed time between the collapse of the first tower and the second tower on September 11, 2001.